The limb of the instrument is engraved with a 90 degree scale reading to single degrees grouped and numbered by fives. Above this is a recessed slot in which slides the cursor engraved with a zodiacal calendar scale (with 0? Aries at approximately 132/3 March), with named months and signs. The zodiac signs are divided to 2 degrees in unnumbered groups of six and named in Latin in a well executed gothic script with contraction marks. Two particularities of the inscriptions are the conversion of the centre bar of the 'E' of 'LEO' into an arrow which transpierces the letter and the linking of the 'R' and 'A' of 'LIBRA' by a bottom loop whereas the letters of this and all other names are carefully separated. The months are divided to two days by unnumbered groups of six, a half division being added to complete the account for months of 31 days. February is divided to 28. The month names are given in heavily contracted Latin forms, particularities being March written as 'MARCI<US>' and February as 'FEBRO'. Above this in the apex of the instrument is a twelve part shadow square numbered 4, 8, 12 on each side over which are scribed the arcs for the unequal hours numbered from right to left 6, 5 / 7, 8 / 4, 9 / 3, 10 / 2, 11 / 1, 12, the descending series reading in the sense of the limb of the instrument, the ascending in the sense of the apex. On the reverse of the instrument is a circular zodiacal calendar (0? Aries being closer to 131/2 March than on the face) enclosing a scale of 28, presumably a lunar scale for use with a volvelle now missing which would have rotated around the pivot over the central blank space. As more space was available on this scale the month names are given more fully than on the face. February appears as 'FEBROA', March again as 'MARCI<US>', May as 'MAY<US>'. Among the zodiac signs the E of Leo is once more pierced by an arrow which now becomes the link element tying the word together as the letters are spaced out to fill the larger division available to it. Similar use is also made of the loop linking the 'R' and 'A' of Libra which is here doubled, while decorative flourishes are added to the top of the final S of Pisces and Aries. In effect the maker has attempted to make the different length words fill equal amounts of space in the divisions so as to create an overall harmonious effect. Two sighting pinnules, with scrolled lower parts (those to the lower sight broken off) on the back of the instrument, are set on the edge where the slot is left open to allow the cursor to be set for December in latitudes above 45?. Each pinnule is pierced with two sights larger and smaller. The plumb-line, that also carried the shadow-casting bead, was attached to a small pin set at the centre of the hour diagram. 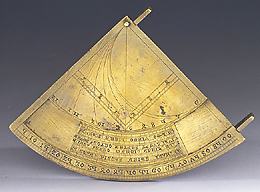 This instrument is one of a group of only three surviving medieval quadrants of this type, the other two being preserved in the Museum of the History of Science, Oxford (c. 1300) and the British Museum, London (14th century). A 16th-century dial of the same type is also preserved in Museo di Storia della Scienza in Florence. The lettering of the three pre-1500 quadrants appears to be distinct, with that of the London and Oxford instruments being closer in style than is either to the Florence example.